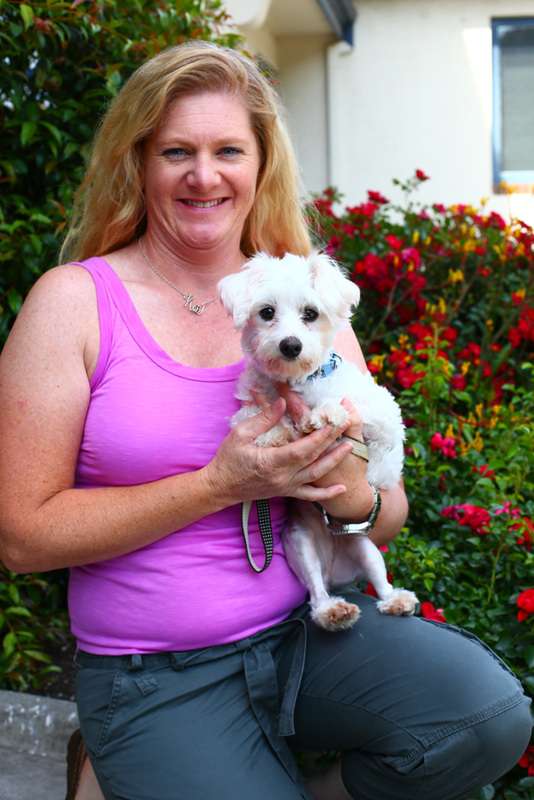 Recently on a delightfully warm afternoon, the air was sweetened with the feeling of hope and a new beginning for not only nine-month-old Maltese poodle mix — Maggie — but also her former foster carer, and now adopter Kate. Found straying by City of Yarra animal control officers, Maggie was brought to The Lost Dogs’ Home needing urgent care and attention. Weighed down by a heavily matted coat and suffering from an ear infection, it was immediately clear Maggie had never been groomed or bathed. “Unfortunately, we see many cases of neglect like this,” said Sue Conroy the Home’s general manager of shelter operations. “Too many people take on dogs like Maggie when they are cute fluffy puppies without fully comprehending the commitment they must make to regular grooming and how neglecting to care for the coats can cause their pet serious discomfort and pain. Following the mandatory eight day wait period, Maggie was not claimed by her owner and underwent a second health examination at the Home’s hospital. “The examination revealed she had weak joints, a condition she most likely suffered since birth,” said Ms Conroy. “It’s a delicate assessment our veterinarians have to make, whether to intervene or not, as doing either could potentially lead to early onset arthritis. 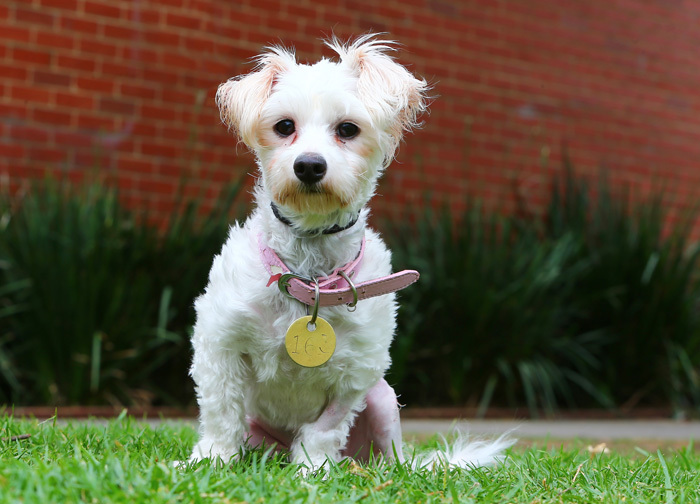 A common surgery with smaller breeds like Maggie, Ms Conroy said patella surgeries are among the top three most frequent stray surgeries performed at the Home – with a double patella surgery costing the Home just under $1000 per patient. Maggie was admitted to The Lost Dogs’ Home Frank Samways Veterinary Clinic for the surgery. “She was a terrific sport and bounced back from surgery really well,” said Ms Conroy. “But being full of beans we needed to pair her up with a foster carer who had the experience of how to care for a dog recovering orthopedic surgery. Tragedy struck Kate’s family in March this year, when they sadly and unexpectedly had to say goodbye to their two beloved little dogs. Deeply fond of all animals Kate, who formerly was an animal attendant, said it was a tough time for her whole family including her two sons who shared a special bond with them. “They were such an integral part of our family,” she said. “We were so accustomed to seeing their beaming faces following us around the house and our property —the silence of their absence was really hard. Kate said she has many fond memories of both beloved dogs; her Jack Russell shadowing her around the house and outside when she went horse riding, and the life lessons her Chihuahua taught her two boys. “The Chihuahua was given to us by an older lady who was moving to a nursing home,” she reflected. “So I would take her regularly with my boys to the nursing home to spend some time with her former owner. Keeping a close eye on Maggie, Kate said it was crucial she minimised her movement to assist with her post-operation recovery. “We had to be very carefully when we first got her to make sure she didn’t jump up on us or onto furniture, which was a little bit of a challenge given her terrific energy, but we had a few special strategies recommended to us by the Home’s vets! As Maggie forged bonds with everyone, she brought to the family a great deal of happiness so Kate and her family decided after careful consideration, they would apply to adopt her. No stranger to the experience, Kate and her mother had previously adopted from the Home. Looking forward to taking Maggie home to her family, Kate said she especially could not wait to take a family portrait: “It sounds probably a little bit vain, but a lot of my friends know that I am an animal lover and how grief stricken we were when we lost our dogs,” she said. View our all our adoptable cats and dogs today!